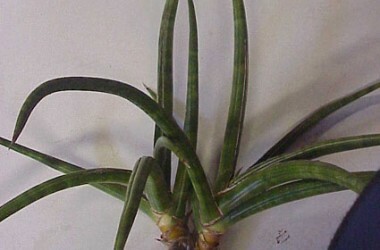 Short rigidly curved leaves horny-edged in very compact, tight rosettes. 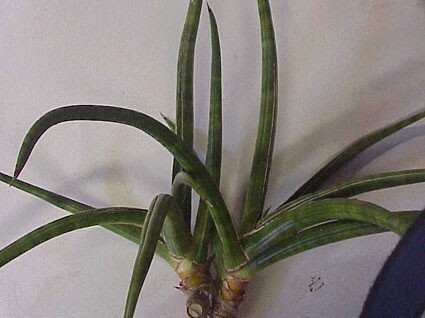 Manda's clone (we bought this in the mid 70s at Manda's Greenhouses in N.J.), habit of an extreme skinny aethiopica type but with a more out-arched habit: A dependable dwarf houseplant subject tolerating very unfavorable conditions. 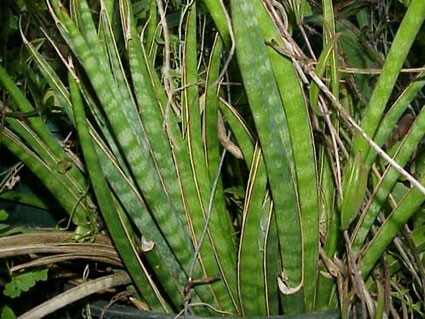 Coloration can vary from green to some banding on this slow growing but distinct plant, depending on level of light saturation and on amount of fertilizer. 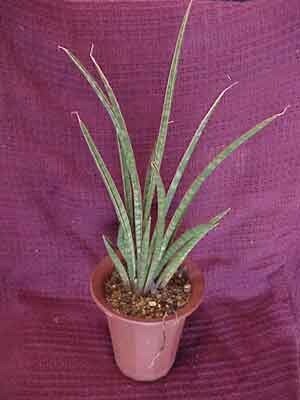 Unusual even though it may be yet another aethiopica collection originally. Best inquire as to availability before ordering as this is quite slow to propagate, and seems much in demand by Asian collectors. Slow to produce, so sometimes availabilty is limited.